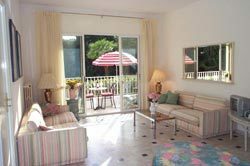 This delightfully bright apartment sleeps 2 (or 3 or 4) people, is on the raised ground floor, in a very calm, quiet and sunny location and directly overlooking beautifully maintained private sub-tropical gardens. 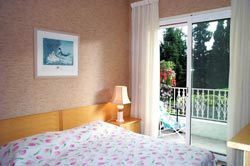 The apartment is in one of four modern apartment buildings, each with its own resident concierge/guardienne and set within their own large private grounds and entered by electrically controlled gates in the attractive university area (Facultes des Lettres). There is unrestricted private parking within the grounds - very important if you are arriving by car or intend to hire a car for a few days whilst you are here. 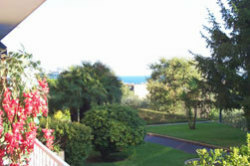 By taxi, hire car of private car the property is conveniently only six minutes from Nice airport. The apartment building is approached up ten broad marble steps through two pairs of double plate-glass doors into a very spacious and impressive marble-clad entrance hall, which runs through to matching doors and steps down to the ornamental gardens. There is an entry phone. The living room and bedroom both have large sliding patio doors onto your own balcony/terrace facing south-west. This is a very peaceful location, you are not overlooked by any other buildings, and there are no ball games or children's games allowed in the gardens. 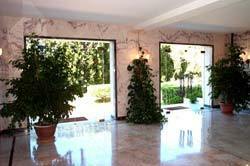 You can just see the Mediterranean through the trees of the garden, less than 400 metres to your south. Balance to be paid - 2 months to arrival.